A Nicaraguan sugar cane worker stays hydrated with a portable water pack. On the sugar cane plantations of Central America, young men are dying in alarming numbers from a kidney condition whose causes are not fully understood. In some Nicaraguan towns, as many of 70 percent of men are afflicted with a form of chronic kidney disease (CKD) that is relatively uncommon worldwide but prevalent among industrial agricultural workers. The only known treatment options are dialysis or kidney transplants – which few farmworkers can access or afford. Researchers are looking for the root cause of the disease –a leading cause of death among young men in Nicaragua’s agricultural lowlands – but UC San Francisco graduate student Anthony Nardone isn’t waiting for answers. Anthony Nardone presented his portable water project as part of the 2016 Clinton Global Initiative. 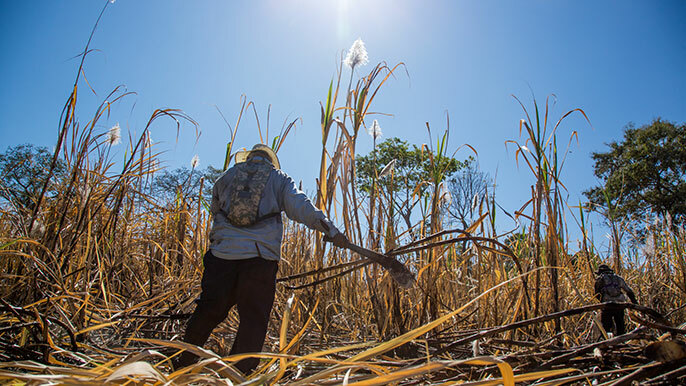 Earlier this year, Nardone launched a program to help sugar cane workers protect their kidneys by staying hydrated during long hours spent toiling in the fields. Nardone, who will graduate this summer with a master’s degree in global health, was doing research and volunteer work in Nicaragua, and was moved by the plight of the sugar cane workers. Men labor in the sun 12 hours, six days a week, for up to six months at a time. They are paid based on how much they cut. He hit upon the idea of distributing a simple, portable device that could help men stay hydrated while working. While drinking more water alone may not solve the illness, it can reduce stress on the kidneys both for those suffering and those at risk. To set up a pilot program, Nardone worked with La Isla Foundation, a nonprofit named after a small Nicaraguan municipality where a majority of deaths in men between 20 and 50 years old are due to this unusual form of CKD. The foundation solicited CamelBak, manufacturer of drinking water backpacks, and set up a pilot program to distribute the water packs to Nicaraguan fieldworkers. Now the organization is working to design a bag specific to sugar cane work and develop a sustainable business model. It is also looking to expand the partnership with CamelBak or other interested organizations. At a health clinic in Limón, Nicaragua, Nardone helped women access basic care. The water pack project isn’t the first heath hack Nardone has come up with. He began working in global health as a volunteer and clinic manager with Project Limón, an effort to provide infant and women’s health services to a small town in Nicaragua, a three-hour bus ride from regular medical care. Clinic staff launched a campaign to promote breastfeeding, which was viewed by many local women as low-status compared to using formula. Many women who gave up breastfeeding would water formula down to save money, which could cause infants to become malnourished. As part of a drive to increase breastfeeding, Nardone solicited donations of breast pumps from friends and acquaintances in the U.S., and gave them out as a way to enable women to continue to nurse their babies after they returned to work. For his global health research, Nardone is looking at adults in Northern Chile to see if obesity together with exposure to high levels of arsenic in the drinking water increase the risk of lung damage. After receiving his master’s degree this summer, he plans to go on to medical school. Ultimately, he hopes his work will help him address the broader health, economic and environmental disparities that contribute to the high incidence of CKD and other diseases. But for now, he is eager to promote interventions such as the water pack project that can improve people’s health in the near term.